Nice buffet breakfast at the hotel. Picked up by our guide, Ali, and driver, for a day at Ajanta. 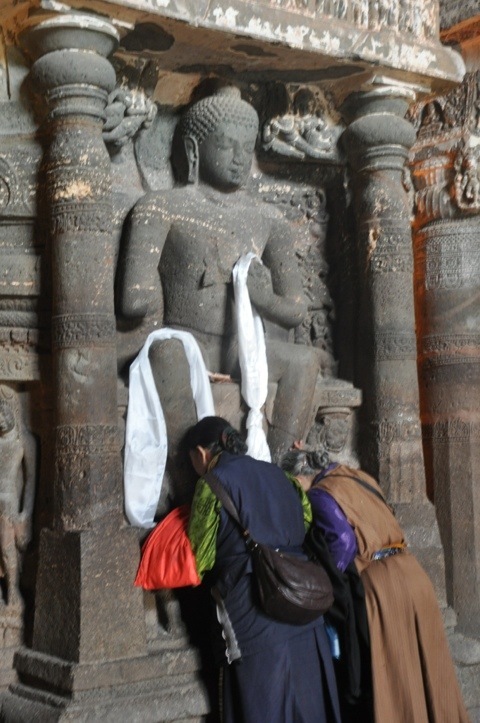 We’d come to Aurangabad to see the caves at Ajanta and, tomorrow, the caves at Ellora. 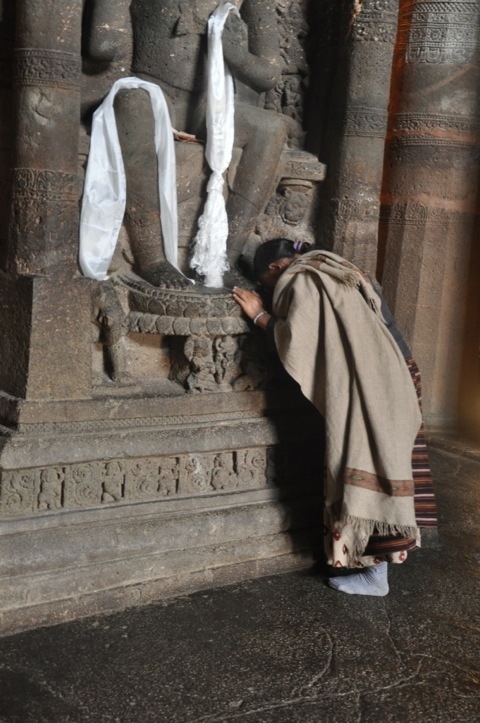 As you’ll read, Ajanta is spectacular, but first some reflections on what we see and learn when we travel, borne from the two-hour rides to and from Ajanta. After fifteen minutes or so of our ride, having had only very limited and brief conversation with Ali, I asked him a question, he answered and I thanked him and said that we’d be interested in hearing anything he’d like to comment on as to what we were passing along the way. This simple invitation unleashed a wealth of commentary, Ali telling us that it would be his privilege and honor to talk about these things, if he would not be getting on our nerves. I said that I’d make him a deal, we’d tell him if he was getting on our nerves and, otherwise, he should assume that we were interested in what he was talking about. It’s clear that, had we not invited his comments, most of the four hours there and back would have passed in silence. This invitation also opened up a connection between us, as Ali, learning that we were from Chicago, told us that he’d spent two years there, and knew and loved the city well. We began talking about things in the city and he mentioned Brookfield Zoo. We asked whether he’d been there and he said, yes, that he’d seen Bengal tigers there. We said that we’d seen Bengal tigers in Khana National park in central India on our first trip, and we all laughed at the irony of him coming to see Bengal tigers in Chicago and us going to his country to seek them out. But, despite our limitations, let me try to give you a brief description of what we learned from/saw with Ali today. Towns teeming with activity because of market day, held on rotating days in villages to give the many people who live in villages far from cities and roads the opportunity to sell and buy goods. Numerous small groups of teepee and tent-like structures, often roofed with tarps, lived in by migrant workers, who leave their villages for eight months a year (returning for the four monsoon months) to work the farms of wealthier people. Many of their children are delivered by midwives in these temporary quarters. Sugar cane and cotton are the main crops. Cotton piled in fields near gin mills. Tiny temples by the roadside for farmers to worship their gods during breaks in their day. Dry river beds of “seasonal” rivers filled in monsoon season. Roadside crematoriums outside towns. Teak, castor, arcadia and banyan trees, which drop roots and grow new trees (“walking” trees). Ghandi white hats worn by farmers (and yesterday’s dabbawallas), a style chosen by Ghandi and continued by Nehru because the hats are simple, cheap, and not Brittish. Cricket match played on a field strewn with litter and encircled by motor bikes of “fans.” Driving on these 2-lane roads is a perpetual game of chicken, encountering other cars, buses, people riding two (or more) to a motor bike, no helmets, women on the back wearing colorful saris, ox-drawn carts, trucks piled high with grains, cotton and people. All this and more, before even getting to the caves, located two hours from Aurangabad, a modest-sized Indian city of some two million. 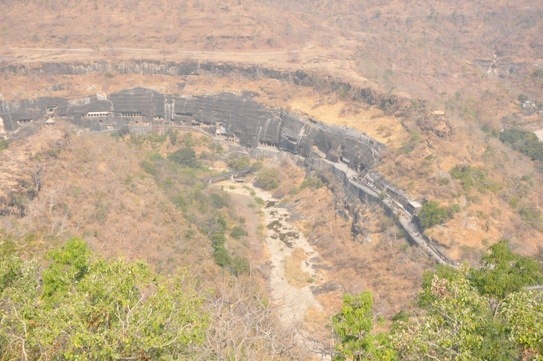 The caves at Ajanta date from 200 BC to 650 AD and are cut from the volcanic lavas of the Deccan Trap in a steep crescent shaped hillside in a forested ravine. Carol and I elected to forego the easier way to enter the site, instead hiking down from a ridge opposite the site. We’ll undoubtedly pay the price with aches tomorrow, but think it was a good decision. 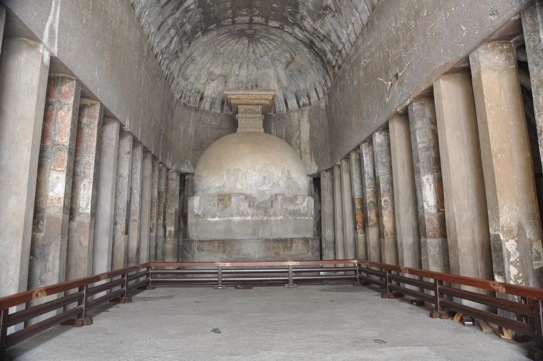 At the height of its importance, the Ajanta Caves housed over 200 Buddhist monks some of them artists as well as numerous craftsmen and laborers. These caves or vihararas are remarkable for the quality of their carvings and their murals which relate the life story of The Buddha and reveal images of the royal court, ordinary family life, and street scenes. 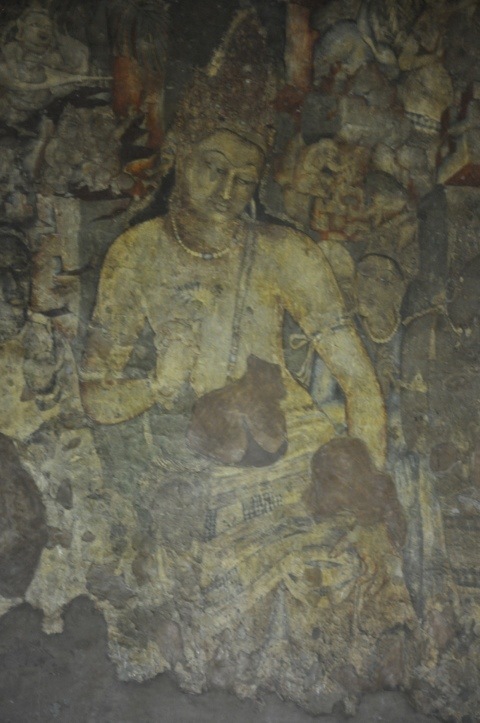 Some of the cave murals relate to the Buddha’s previous births. It’s impossible to convey just how astounding these monasteries and caves, carved out of a mountain of basalt stone are. The whole complex is essentially a single block of stone. The site is owned by the Indian government and as a World Heritage Site is governed by rules of UNESCO. what is a domain Rather than babble on with more words, I’ll just attach a bunch of photos to try to give some idea of what I’m talking about. Sorry, but that’s about the best I can do right now. After arriving back at the hotel late in the afternoon, Carol had a massage and I swam briefly and sat by the pool. We had a lavish Indian barbecue buffet dinner outdoors at the hotel, and were treated to a quite delightful local dance performance by three engaging and brightly-costumed dancers. If I ever finish this blog, I’m going to collapse and join Carol, who had the good sense to crash a while ago. Hi Arnie–great blog post. What a thrilling journey. Thanks for letting me tag along!! Arnie – your blog continues to be just spectacular. I think that you may well have found your next career – travel writer wallah! It’s really the next best thing to being there. The caves sounded (and looked) beyond stunning. Amazing pics, Dadz. And way to invite commentary! Sounds like an incredible ride and an incredible destination. Still trying to catch up on your adventures.